Posted June 17, 2013 by Will (Chief Information Officer) . Have you noticed a recent change in your Facebook news feed? 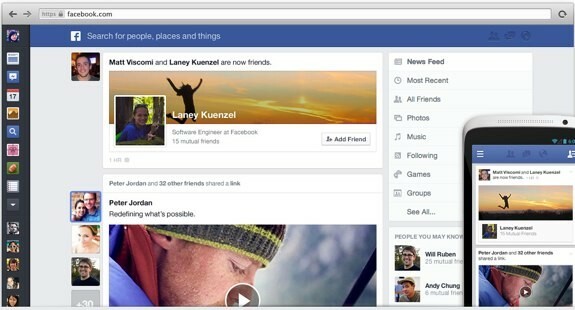 If yes, then your account has been included in the initial rollout of the new and improved Facebook News Feed. The new layout was created due to a dramatic increase in content including photos and videos over the past year as well as a need for a more compatible design for tablet and mobile users. 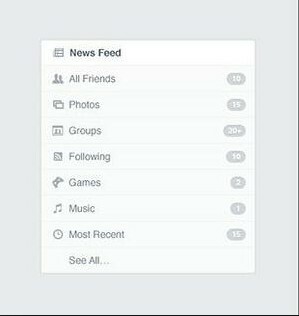 In order to make these content types more visible, Facebook has now made the news feeds wider by reducing the size of the left sidebar. This allows more room for photos, thumbnails, shared links, ‘like’ stories, photo albums, and much more. The wider news feed doesn’t just mean that the images and stories that you see will be bigger; it means your fans are going to have a more enjoyable user experience and be more likely to engage with you if your content is exciting. This can mean great things for the future of business pages, but it can also pave the road for a decrease in fan engagement if you don’t have a strategy to take advantage of this new feature. Today’s social media revolves around content that is geared specifically towards entertaining and sharing an online experience with your customers. That being said, posting generic pictures every once in a while will no longer do. Every image, video or link you post should be unique to your brand, industry, and of course the information your customers need and want to know. Posting more often is also recommended for business pages with the new layout. Another change that is included with the news feed update is a more customizable and user friendly “Following Feed.” This new feed allows users to see the most recent posts OR they can just see a feed for the pages they follow by “liking” them. When a user looks at this feed, it will list the posts in chronological order, which could negatively affect your pages visibility and reach depending on the frequency and popularity of your content. Before we know it, being at the top of the following feed could become just as competitive as ranking on the first page of Google! Business owners and marketers will have to measure and track how many users actually use this feed once the rollout is complete, but it may lead to yet another big change in the way businesses use Facebook in the future. When Will Your Page Make the Switch? The limited release has continued to transfer pages since early March, but the rollout has not reached all users yet. Want help with your Facebook strategy? Call us today!